USB to serial chips are often used as a debug interface either directly on the target board, or via a dedicated debug board. But some models have extra pins exposed, and one of those is WCH CH341, which also includes I2C & SPI interfaces and up to 8 GPIOs. But software support for those extra pins is not currently built-in into the drivers found in Linux mainline, and you’d also have to find a board that breakout the relevant pins. It turns out there are few of things including “CH341A ALL IN 1 USB to SPI/I2C/IIC/UART/TTL/ISP serial adapter” board going for $10 shipped on Aliexpress, and which Zoobab successfully used to control 6 (out of 8) GPIOs over USB. 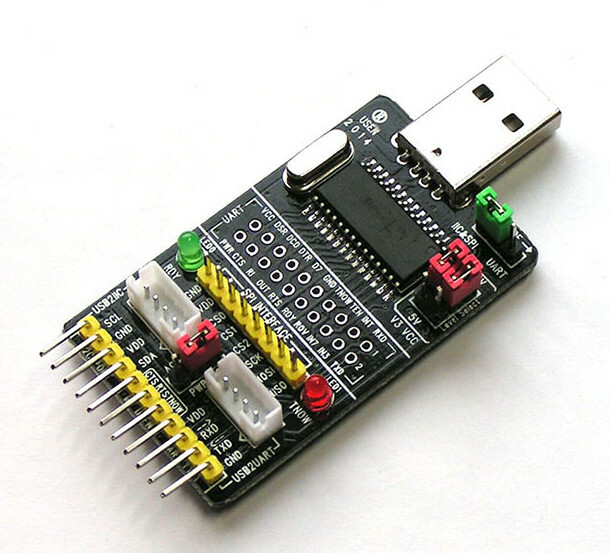 The board comes with a USB board to connect to your computer, several header for I2C, UART, SPI, some LEDs, and jumper to select I2C/SPI or UART mode and voltage (5V/3.3V). He also benchmarked the pins with a shell script to turn on and off connected LED, and managed to do that at around 2.2KHz. It may be a little faster by changing the I2C bus speed (100 kHZ by default) and/or using C code instead. Alternatively, using spi-ch341-usb driver from the same developer (gschorcht) may speed things up a little bit despite the documented “slow SPI”. Another shell script with 6 LEDs connected to the board is demonstrated below. Anyway that good news since that means you can add (extra) GPIOs to any Linux board with USB relatively easily and cheaply. But if you’re not quite willing to spending $10 on that option, there are cheaper options such as a CH341 USB programmer going for $2.30 + shipping on Electrodragon, or CJMCU-341 board sold for around $5 including shipping on Aliexpress or eBay.